ShowBiz 5 creates and edits videos like a pro! Perfect each frame in your movie. Add effects, texts, transitions, titles, or even narration to make your movie a masterpiece. Adjust colors by changing the hue, saturation, brightness, and contrast. Apply the Anti-Shaking tool for smoother playback. Use the Denoi se tool to reduce the noise level in a video. Use Rotate & Flip to correct position and Crop & Trim to get rid of unwanted parts. ShowBiz 5 includes both a Storyboard and Timeline mode. 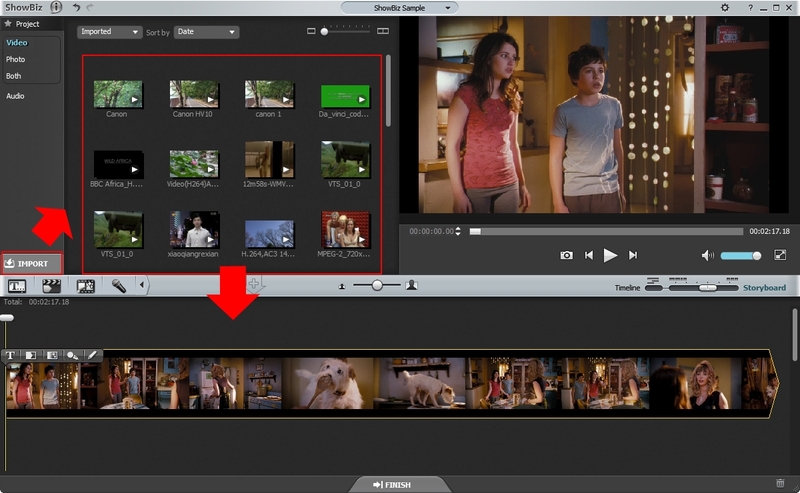 Arrange the clips and photos, add a transition, drop in cool effects and music in Storyboard mode. Stretch the Timeline to add effects and audio at a precise point. Hide a track to focus on a specific layer and mute the audio in Timeline mode. Adjustable screen and thumbnails allows for easy viewing of multiple tracks and your source files. Supports left-right, top-bottom, and red-cyan formats. Share your final movie by uploading to a YouTube 3D channel. Gives you the tools to perfect your movie by adding a superb soundtrack. Compose your ideal soundtrack using multiple audio tracks. Fade out music as your voice-over track fades in. Increase the audio playback speed, and adjust the volume, incrementally.